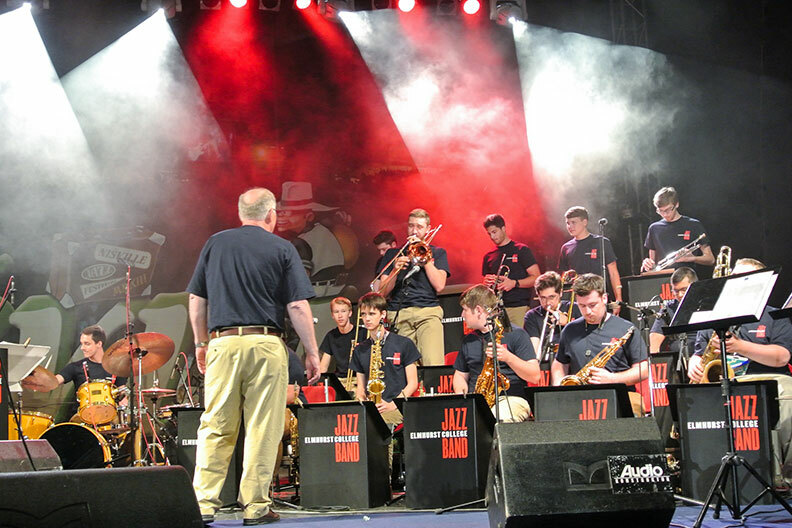 One of the country’s oldest and best-known collegiate jazz festivals, the Elmhurst College Jazz Festival features some of the country’s top artists and college bands. Featured performers at this year’s Festival include the John Fedchock New York Big Band, Michael Davis and the Hip-Bone Big Band, trumpeter Randy Brecker, saxophonist Bill Evans and guitarist Mike Stern. Each February, the best college jazz bands in the country come to the Elmhurst College campus for three days of performances and education. The bands take turns performing for some of the greatest names in professional jazz today, who offer critiques and award a variety of honors. The professionals cap off each night of the Festival with a rousing performance of their own. The Festival begins at 12:30 p.m. on Thursday, Feb. 21, with the High School Invitational, followed by a feature performance by Randy Brecker, Bill Evans and Mike Stern with the Elmhurst College Jazz Band. Friday’s evening session begins at 7:30 p.m. with performances by college ensembles and Mike Davis and the Hip-Bone Big Band. On Saturday evening beginning at 7:30 p.m., the featured performance is by the John Fedchock New York Big Band. The Sunday performances begin 11:30 a.m.with several Chicago-area college ensembles, and conclude with a performance by Randy Brecker, Bill Evans and Mike Stern with the Elmhurst College Jazz Band. This year, some of the participating college bands include Purdue University, College of DuPage, Ohio State University, University of Wisconsin–Whitewater, the University of Arkansas and the University of Illinois-Chicago. The Elmhurst College Jazz Festival will be held in Hammerschmidt Memorial Chapel.